1. The size of your house, the kind of car you drive or the clothes your kids wear to school is not a reflection of your value as a Dad. Despite shifts in societal thought, Dads, including me, feel a strong obligation to provide for their family. This is pretty normal guys. Moms, realize that your husband thinks about providing often and not just because he’s a workaholic, because he is vain or consumed by money, but because he loves you and his kids. But Dads, it’s time to realize and to let go of the correlation between your net value and your Dad value. Providing also means providing love, learning, kindness and guidance. Remember to provide those things and stop the comparisons and sizing up that happens in our minds. 2. You may have to read a book or ask for directions. Contrary to popular belief, you don’t know everything and getting suggestions and directions from others can save you a lot of time and heart ache. Be willing to admit that you may not have all the answers because that is the beginning of enlightenment. 3. Mom has dealt with way more meltdowns than you, so chill out. I’ve worked with a lot of kids in counseling and the truth of the matter is that moms tend to get more backlash than Dads, but Dads seem to be more put out by the resistance they do experience. I don’t know all the answers of why this is true but just remember to be grateful for a caring and patient wife that deals with things that you don’t have to. When your child tantrums or is disrespectful, realize these things happen. Keep your cool and bask in the time you have with your children. 4. You will be exhausted. We often get home from work and have this sense of entitlement to sit down and relax, after all, we’ve been working all day, but parenting doesn’t work that way. The invested Dad is going to be tired each night when he lays his head to the pillow. You can do hard things. You’ve exhibited that before. You have more in you than you often think you can give. Keep going. It pays off like nothing else! 5. You tend to get the best of your children so recognize it and celebrate it. Dads and even working moms know what it feels like to come home from work and have your children come running toward you with open arms. There are few feelings like it. You will have moments that are challenging but you tend to see more of the sunshine in your kids. Realize that your wife or kids mother loves to see you play with the kids and enjoy them. Don’t get bogged down by the challenges. Celebrate the special relationship a father has with his children. 6. Kids get sick, and your wife works too so help out. I’ve heard too many Dads say, “I don’t do vomit.” I’ve got some news for you. Neither does your wife but she does it anyway. Whether Moms work in or out of the home, their job is equally as taxing as Dads job. The daily workload of a mom warrants a little help with the afterhours needs of the kids. If you already do this, give yourself a pat on the back and then refer to truth number 4 again, because it’s been my experience that children do not throw up in regular waking hours. They generally select that moment right before you fall into your deep sleep to throw up. You will be exhausted but it won’t last forever. Your kids and family need you. They need your actual presence. It’s easy for Dad to get wrapped up in work and other extracurricular activities and forget about home. Men compartmentalize their lives which can be good to help us separate what happened at work today from what is going on at home, but it can also contribute to our lack of consideration of how our actions may interfere with the family. Cut out the things that are less productive or take away from what your top priorities are. 8. Failure is inevitable, OK and even desirable. I always teach parents to trade perfection for improvement. Failure is a word that has a negative connotation, but if we simply regard it as part of a growth cycle, it is not the enemy but becomes a catalyst for learning. In our career or in fatherhood we make mistakes and have failures that pave the way for growth opportunities. 9. Laundry is never done, so iron your own stinkin’ shirt and just wear the same black socks you wore yesterday with a smile. If you have a wife that stays at home with your children, it can be tempting to think, “I have no matching socks and have nothing to wear this morning. What does she do all day while I’m gone?” Yeah, I wrote that out for my wife to see. The truth is, she cares for your children, cleans, cooks, cleans again, educates them, does far more for you than any person should have to do for another capable person and does a lot of laundry. The fact that you don’t have a shirt to wear probably has more to do with the fact that all of your clothes are in a heap on the floor rather than in the hamper. Truth is, your wife is busy so just figure it out and put on a smile. 10. Play with your kids, no matter what age. Put down the smart phone, the game controller, the I Pad and the TV remote and really connect with your kids! I think that men have an even stronger affinity for technology than women and can so easily be distracted. We can sit down in a room with our kids and think that we are “bonding” when we are completely ignoring each other. Wrestle, tickle, play catch, get physical and do something that encourages health, ingenuity, communication, education and genuine happiness. 11. When kids break or ruin things, it’s not because they want to make you angry, it’s because they are kids. Don’t take it personally. Kids are impulsive. The fact that your son put nail polish on the TV was not a personal attack or an attempt to communicate that he is not grateful for what you have provided for him. He just thought it would be pretty and you know what, it kind of is. Remember when you respond that the objective is to teach, not to inflict pain and misery. 12. Don’t worry so much. It will all work out. 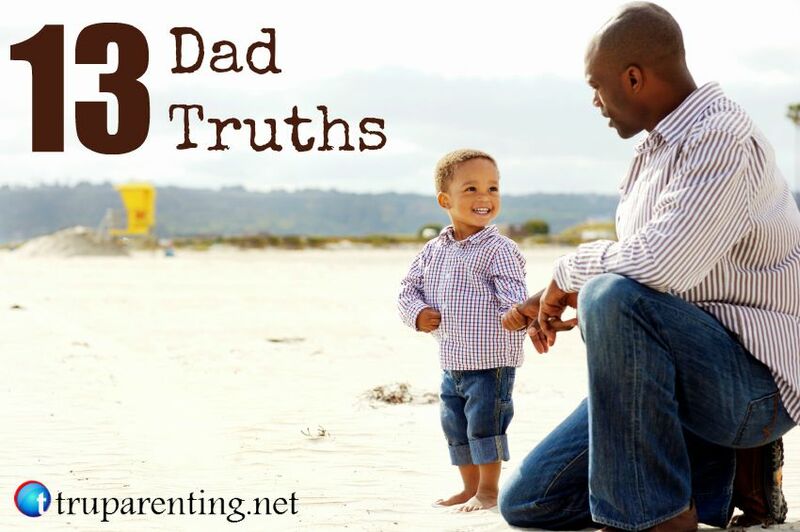 I’ve known a lot of Dads who bring the hammer down when their child does something wrong. These Dads worry that if their punishment isn’t harsh enough, their child will grow up to be a criminal. Relax. Respond with kindness and a conscious intention to teach. A child does not have to feel miserable to learn and if Dads can learn to deliver discipline in less intense emotional ways, the results are often better. Just because Jr. tries to take a candy bar at the grocery store doesn’t mean he will be a car thief in 15 years. 13. You are not Superman, but your kids think you are. Your children put you on a pedestal. They hold you up as a giant even though you are not perfect. They think of you as a hero but not because they are fooled into thinking you never make mistakes. They think of you as a hero because you are there. You do things for them that they can’t do for themselves. Be grateful for that admiration that you may or may not have earned. When they look at you with eyes struck with awe because you opened a jar that they couldn’t, when you fixed the sink, when they pinned you wrestling or just when you took their outstretched hand, realize that you don’t have to do everything or be everything; you just have to be Dad.